A couple kisses on the stairs at Sleepy Hollow Country Club in Briarcliff Manor, New York on their wedding day. The architects, McKim, Mead & White designed the mansion which was originally built as Woodlea Estate for Margaret Vanderbilt Shepard in 1892–95 and cost a whopping $52 Million in todays money. In terms of space, it is one of the largest private homes ever built in the United States. 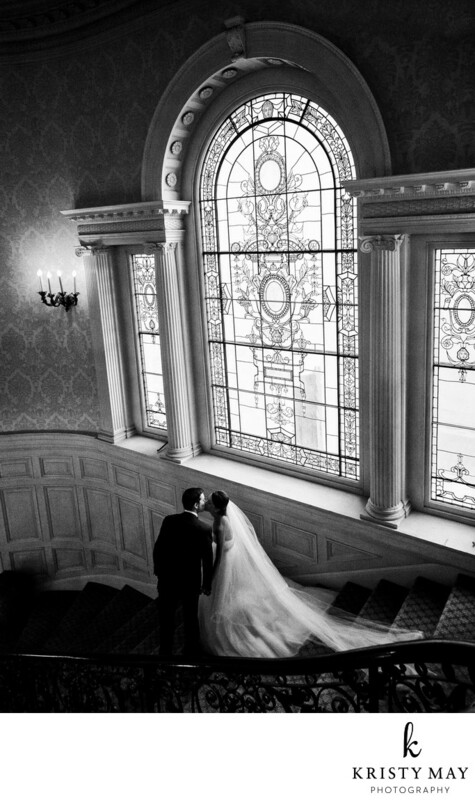 The staircase features a large triple Palladian window, which has stained glass making for a dramatic location for a wedding portrait. The gilded age mansion is popular for weddings because of the beautiful Rennaissance Revival and Beaux-Arts architectural features as well as the large grass terrace overlooking the Hudson River. Most events take place in a large tent erected on the lawn. Location: 777 Albany Post Rd, Briarcliff Manor, NY 10510.